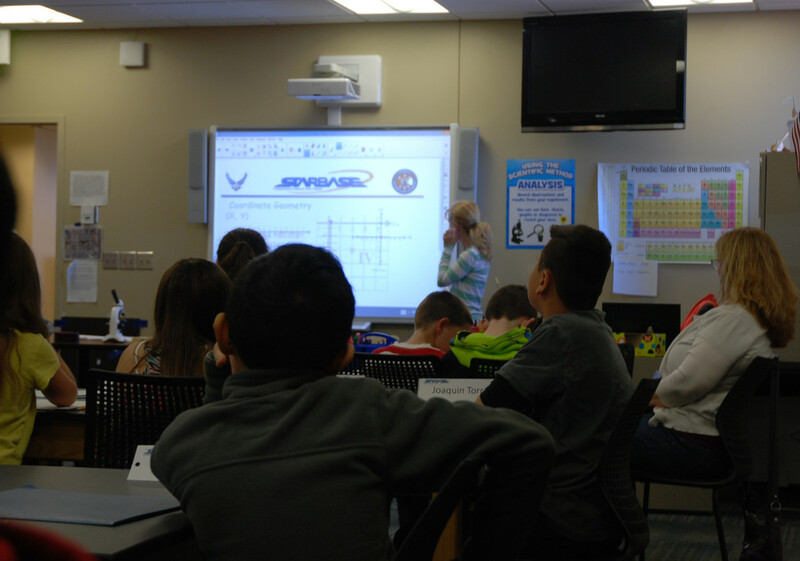 March 8, 2016 – About a year ago a group of fifth-graders from McAuliffe Elementary School became the first students to enter into the STARBASE Academy program at Peterson Air Force Base. The program brings students to the Academy to learn about science, technology, engineering and math using a curriculum specially designed to immerse them in hands-on experiences and teaching. Through the five sessions, held once per week, the aim is to get STEM education to stick with students long after they depart from the Academy. There is no charge to schools participating in the program. The STARBASE Academy has experienced a great deal of growth, said Patty Smathers, academy director. Since the facility opened, 71 total classes have passed through the program, totaling about 1,500 students. The number of schools participating in STARBASE Academy has grown significantly as well. Smathers said 11 schools from District 11 have been the backbone of the program, but the coming weeks will include several other districts and schools. Two schools and a charter school from Falcon District 49, Ellicott District 22, four private and charter schools and Harrison District 2 are in the mix as well. The Academy’s curriculum covers physics, chemistry, math, technology and engineering. The staff shares information about the different types of STEM careers, including how STEM fits into a military career. Students also take field trips to places like the Peterson Air & Space Museum, 302nd Airlift Wing, bioenvironmental engineering and the Health and Welfare Center. These visits, as well as visits to the Academy facilities by Peterson firefighters, civil engineering and explosive ordnance disposal members allow students to see STEM in action, something they are not likely to see in a typical school day. “What we do is try to expose them to positive role models and have people tell them how they use STEM in their jobs,” Smathers said. Smathers and her four staff members – two full-time instructors and two part-time assistants – are gearing up for a busy year. Smathers said the schedule is already very full. There are 17 classes locked in and another 25 that need particular dates set. With guests planned like Gen. John Hyten, Air Force Space Command commander and possibly a yet to be named astronaut, Smathers and the STARBASE crew can expect demand to increase. But, she said, those are good problems to have.